If there’s one venue that perfectly suits a fairy light canopy, it’s Loseley Park! We’ve installed several designs there, but this classic single swag canopy is one of the most popular. The lights were installed on the beams over the dining section of the barn. Chandeliers also suit this area well, installed on a beam above the top table. 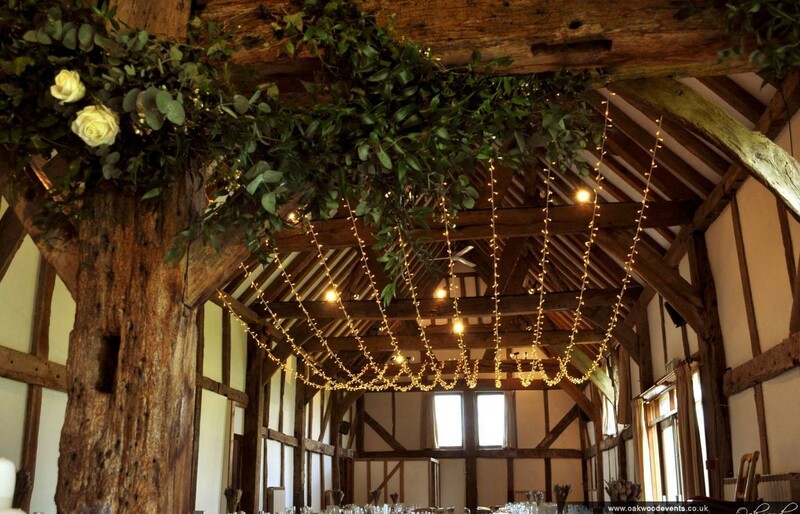 Our chandeliers and fairy lights are all dimmable, so that they can be turned down in the evening. Please see our Loseley Park lighting page for more inspiration, or contact us for other ideas. We have too many great photos to include on a single page!